148,000 Jobs Were Added To U.S. Economy In December: How Key Industries Fared In 2017 : The Two-Way It's a sharp drop from the November result of more than 250,000 jobs. With data for December now in, U.S. job growth fell in 2017, to 2.1 million from 2.2 million in 2016. Retail jobs have taken a hit, losing 67,000 jobs in 2017 after seeing a large gain the year before. In this photo from October, people pass a sign advertising a sale and a job at a shop in Boston last fall. The U.S. economy added 148,000 jobs in December, the Labor Department says, issuing the monthly jobs report from the Bureau of Labor Statistics. 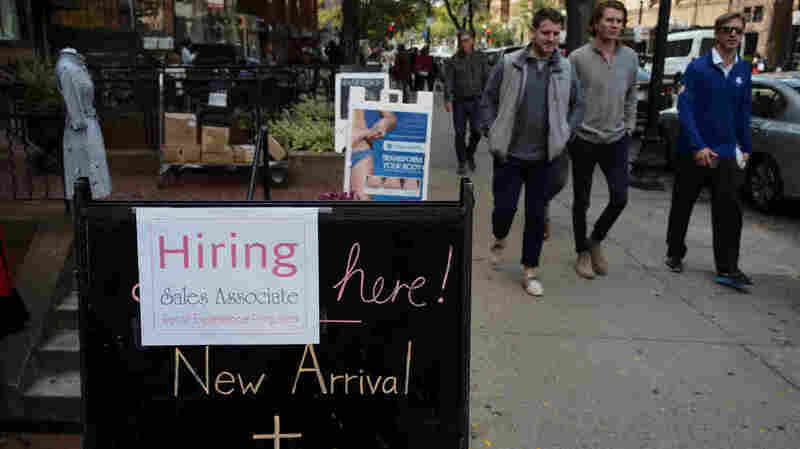 The unemployment rate was 4.1 percent, unchanged from November. Analysts had predicted the Labor Department report would show another month of solid job gains. But it's a sharp dropoff from the revised November result of more than 250,000 jobs. "Employment gains occurred in health care, construction, and manufacturing," the BLS says. Many other sectors and nearly all demographic groups saw little change. With the data for December now in, U.S. job growth fell in 2017, to 2.1 million from 2.2 million in 2016. The result narrowly maintains the country's seven-year streak of adding at least 2 million jobs. Health care added 300,000 jobs, less than the 2016 increase of 379,000. Professional and business services added 527,000 jobs, in line with its 2016 gain. Construction employment rose by 210,000 — higher than the 155,000 gain in 2016. Factory employment increased by 196,000, after seeing little change in 2016. Retail employment edged down in 2017, losing 67,000 jobs after gaining 203,000 jobs in 2016. The food services and drinking places industry added 249,000 jobs, slightly down from 276,000 in 2016. The agency also issued revised figures for the two most recent months, dropping the October number from a gain of 244,000 to a gain of 211,000 and raising the November result from 228,000 to 252,000. Together, those months' gains are now 9,000 less than had been previously reported. Average hourly earnings rose by 9 cents in December, to $26.63. Over the past 12 months, the BLS says, average hourly earnings have risen by 2.5 percent.